plurality: 44,404 -- King won in 31 of 32 counties, with Shomshor winning in Pottawattamie. Peggy Smalley of Audubon is the District Chair. There are three Vice Chairs: Rick Mullin of Sioux City (northern counties), Les Lewis of Denison (central counties), and Harold Swanson of Glenwood (southern counties). 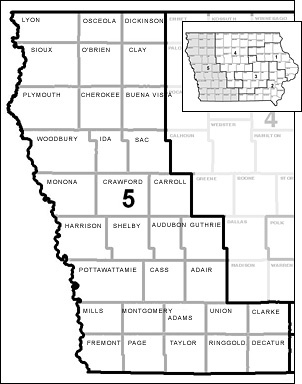 The committee includes 3 representatives from each county.